Combination Play: What should Portugal do? In Group B, the so-called Group of Death, everything is still up for grabs, even for Germany, on six points. No team has clinched qualification yet and all of them stand to be eliminated, with the right set of results. Next Sunday, Portugal and the Netherlands will meet for a decisive match, a match which the Dutch need to win by a two-goal margin and hope that Germany won't rest on their laurels against Denmark. Bert van Marwijk's team is far from a solid, cohesive unit. More often than not it ends up breaking in two separate sectors: the 4 defenders plus Van Bommel and De Jong, and the 4 players up front. With both centre-backs clearly uncomfortable on the ball and with little creativity from both holding midfielders, the Netherlands rely too often on Robben's skills, Sneijder's vision or Van Persie's runs in behind the defence. All of this would make up for an interesting attacking plan, but it seems that the players do not have a collective idea of when to do the right thing - Robben's insistent dribbles inside and shots all over the place being a perfect example. Nevertheless, one mustn't forget that this is a team made of some world-class players and that, as Van Persie showed against Germany, a few extra yards of space for either one of those players could mean a whole different game. For instance, Robben tends to play on Portugal's left, the wing that Cristiano Ronaldo does not protect well enough (most likely according to Paulo Bento's instructions). With Van der Wiel looking to go forward whenever possible, this could create difficult times for Fábio Coentrão, yet again. However, both Dutch wingers tend to drift inside with their dribbles, which may play into Portugal's hands, since that is an area in which they have been stronger than on the wings. Also, due to the absence of a collective idea and the lack of movement, the Netherlands try to pass it over the top toward Van Persie. For this particular match, Paulo Bento would be wise to allow Pepe (since he is quicker and more intense) to sweep up and let Bruno Alves take the first line of central defending, as this would keep the Dutch wingers from coming inside and playing Van Persie through on goal with short diagonal balls. Aware that the Netherlands have to win the match by two goals and will probably want to take control, Portugal may well decide to play the waiting game they played against Denmark (after scoring) and Germany, allowing both centre-backs and both holding midfielders time on the ball and then pouncing on the mistakes they tend to make - even though better finishing is absolutely critical. Van Persie is often keen on receiving through balls in behind the defence. Despite having two particularly defensive-minded holding midfielders in Van Bommel and De Jong, this Dutch team does not seem as airtight as it did two years ago in South Africa, even though many of their starters remain the same. Oddly enough for two players with their experience, both Van Bommel and De Jong have been dragged out of position too easily, although it is fair to say that, given the lack of defensive support from the four forwards, they do have a lot of ground to cover. In their previous match, for instance, most of Germany's scoring opportunities came from overloading the Netherlands' left wing, forcing the holding midfielders out wide, and then attacking the space where they were supposed to be. Despite Willem's valiant efforts, the team still remain afraid of letting him on his own against aggressive wingers. 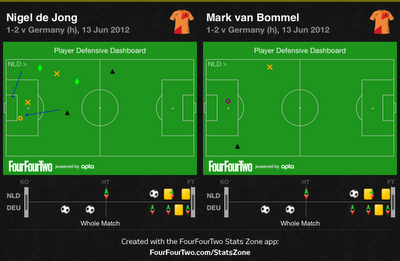 Both Van Bommel and De Jong tend to help out defensively on the left. after forcing the two Dutch holding midfielders out. virtually neglecting the middle of the park. Furthermore, Mathijsen and Heitinga are slow centre-backs who do not particularly enjoy quick forwards or changes in positioning. This may very well be a good time to tell Postiga to work the channels, dragging one of the centre-backs, and instruct either Ronaldo or Nani to make direct runs in the central areas of the Dutch defence. There is one final, important issue. The Netherlands favour a high(ish) defensive line, but do not exert the necessary pressure on the man on the ball, often allowing him to make through passes into the box, where Ronaldo and Nani's finishing skills may prove decisive. If football was played on paper, this would look like a no-brainer. Portugal are better organised, defensively stronger in central areas and like to play on the counter. Besides, their wingers' speed and trickery are exactly what the Dutch defence doesn't need. With Van Marwijk's front four less than willing to help out defensively, Portugal may end up winning just by being smarter. Also, given the Dutch team's profile, Hugo Viana could be a clever move by Paulo Bento, since the Braga midfielder is an expert on picking defences apart by finding quick forwards 30 or 40 yards away with his long passes (even though this option is highly unlikely).